from a chic resort like Positano and you’ll see that it’s a mere hedonistic interlude on the impossibly steep coastline that plunges straight into the Tyrrhenian Sea. You hike the Amalfi because it offers some of the most rugged coastal terrain in the world, peaks that may only be 3,000 to 3,500 feet high but offer unrelenting vertical. You ascend through well-tended lemon groves and fragrant fields of wild roses and rosemary, through cypress groves on dirt tracks and foot trails that once formed the only connection between these still remote villages. Up the rocky flanks of Monte dell Avvocata or through the Valle delle Ferriere, your rewards are the most stunning views in all of Italy. At sunset, you’ve earned a café table in the hilltop aerie of Ravello or the labyrinth maze of Amalfi, a town decidedly more Moroccan looking than Neopolitan. Limoncello, the local lemon-based liqueur, is the antidote for enduring this alfresco stairmaster. Or maybe a day off to take a ferry boat to explore the nearby isle of Capri. 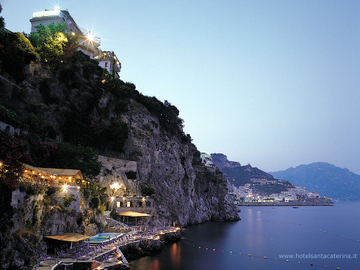 The trick with Amalfi is to avoid the summer high season and to go in the fall, when hotels like the luxurious Santa Caterina in Amalfi, with its seaside pool located 500 sheer feet below the hotel, drop their rates a bit. More affordable is a charmer like the Hotel Lidomare. And for those who like their hiking and biking organized, Ciclismo Classico, Backroads, Butterfield & Robinson are among the companies who’ll organize it all for you. For added thrills, drive your rented Lancia along Amalfi’s textbook hairpin turns and pray to your favorite Italian saint.